Stenting of obstructing colorectal cancers obviates the need for emergency surgery, reducing initial morbidity and mortality rate associated with emergency surgery and facilitates full staging of the neoplastic process with an opportunity to optimize the patient for surgery. Some recent publications have suggested however that this approach may be associated with higher local recurrence rates. We examined our outcomes following colonic stenting as a bridge to resection. 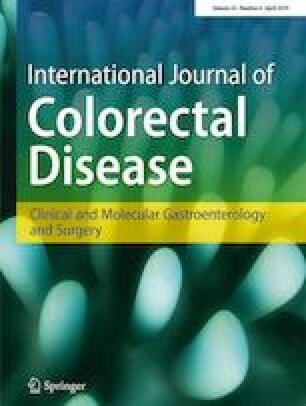 A database was reviewed (2006–2018) of patients presenting with acute colorectal obstruction that proceeded to endoscopic stenting. We assessed the bridge to surgery strategy, its success, complication rate, and impact on recurrence and survival. Of a total of 103 patients who presented with acute malignant large bowel obstruction over this time period, 26 patients had potentially curable disease at presentation and underwent stenting as a bridge to surgery. The technical success rate for stenting in those managed as a bridge to surgery was 92% (n = 24/26) with 7.69% (n = 2/26) having a complication. There was one stent-related perforation. Median follow-up of this cohort was 31 months, with a 5-year overall survival of 53.5%. Colorectal stenting as a bridge to resection is a successful management strategy for those presenting with obstructing colorectal obstruction. Selective use is associated with lower rates of stoma formation, greater rates of laparoscopic resections with low complication rates, and acceptable oncological outcomes.